Austin-based software company Live Earth has launched an interactive, touch-based software platform to streamline the management and monitoring of complex business and security operations. For the first time, organizations can easily visualize and understand all of the data points they have to manage in order to run an operation effectively from a single, interactive screen. Live Earth, the most advanced data visualization platform for directing and monitoring complex business and security operations, today announced the launch of its flagship product. Live Earth combines and simultaneously displays multiple data streams on an interactive, multi-touch map. Data sources supported by the platform are diverse and include real-time vehicle and personnel positioning, global threat data, social media feeds, spreadsheets, and data from third party applications. Users can monitor and direct business and security operations directly from the Live Earth map using familiar tap, swipe, and pinch-to-zoom gestures. Live Earth's interactive timeline feature works like a DVR, enabling users to play, pause, loop, or rewind monitored activities as they occur in real-time. "For the first time, organizations can easily visualize and understand all of the data points they have to manage in order to run an operation effectively from a single, interactive screen," said Jeff Carpenter, president and CEO of Live Earth. "Live Earth's ability to unify data streams in real-time, combined with its multi-touch interface and interactive timeline, dramatically enhances an organization's ability to comprehend and act upon data received from many disconnected systems and sources." Live Earth was originally developed for prestigious divisions of the U.S. military, where it is used for real-time situational briefings and live data monitoring during complex missions. "While we will continue to honor and support those who serve us in the U.S. military, we are excited to offer our solution more broadly to enterprises with similar challenges visualizing and responding to large amounts of global data," continued Mr. Carpenter. "To those who are responsible for saving lives, protecting assets, and maintaining critical infrastructure, Live Earth is an indispensable tool." Enterprises interested in learning more about Live Earth's capabilities can contact Live Earth for a demonstration immediately. Live Earth is an advanced data visualization platform that streamlines the management and monitoring of complex business and security operations. Live Earth unifies data points in time and space to facilitate rapid, informed decision-making. 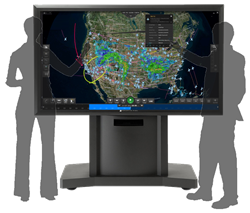 Uniquely suited to live data monitoring, situational briefings, and strategic data analysis, Live Earth helps organizations coordinate operations, respond to crises, monitor assets, evaluate outcomes, and plan for the future. For more information, visit http://www.liveearthsoftware.com.